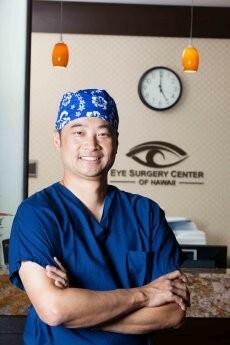 Dr. William K. Wong, Jr., served as an ophthalmologist with the U.S. Army for more than eight years before returning to Hawaii to open Hawaii Vision Clinic in 2005. As a board-certified ophthalmologist he offers comprehensive eye care and specializes in advanced cataract surgery, using the most advanced cataract laser and advanced technology lens implants that can make glasses or contacts unnecessary. This painless procedure takes but 15 minutes, with no shots, and no stitches. So many of his patients are genuinely surprised to see much better right after their surgery. “After improving their vision, my patients often ask to have newly found wrinkles treated as well,” Dr. Wong says. Due to patient demand, he also offers anti-aging injections such as fillers and Botox. Having personally experienced the benefits of LASIK vision correction while deployed in Iraq during Operation Iraqi Freedom, Dr. Wong advocates Laser Vision Correction to his patients. We can eliminate your contact lenses and glasses right in the office with our new LASIK Center. Dr. Wong, Jr. served as the President of the Hawaii Ophthalmological Society and President of the Honolulu County Medical Society. He has been continuously selected as one of Hawaii’s Best Doctors and is highly regarded as a skilled surgeon who colleagues turn to for surgical support, as well as personal treatment. I would recommend this doctor. Bill to others if do not have any one. Dr. William Wong Jr. (Ophthalmologist) is an excellent doctor who is professional and with a very warm, and sincere disposition! Only once the waiting time was longer than expected. Good initial visit. Thorough examination. New patient with Dr. Noblezada and he was great. Excellent service and staff. Very friendly and helpful to patient. Doctor was also very helpful and friendly told me what problem I've had for 2 years. Unlike other doctors I've been to, I've learned more about my condition and its consequences. Dr. Sabahi is very professional. I feel confident in her care, also Dr. William Wong Jr. is an all around person, cheerful and professional. Very helpful and understanding. Works really well with children. Excellent service & results with Dr. Dr. Wong, Jr.
As a new off island patient, I was impressed with the office and medical staff and the doctor who is patient, listens and explains using model and video. Dr. Wong, Jr. is an excellent communicator and practitioner whose manner is reassuring to the patient. I also appreciate that my husband was welcome in consultation. Mahalo nui loa. Dr. Wong and his staff are really awesome. They helped return my quality of life. Now I can see again!